I come from a family of marmalade makers. My granny, my mum, sister and aunts. They all make excellent marmalade. Really, the best. I have assisted on occasion and I have also made a pretty good batch or two myself. And why wouldn’t I with my lineage and living where I do? We have every kind of orange growing around these parts including the knobbly ones that make the best marmalade. The ones that I used for this latest batch were picked off a friend’s tree. 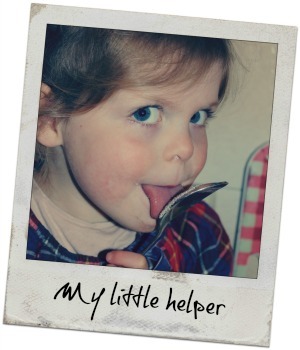 Here is the recipe, as dictated over the phone by my mum, when I first moved to Spain, and written straight into my pregnancy diary, as seen in the sticky little hands of Bibsey below. 1 pair of helping hands Or not actually. Marmalade making is a sticky business. 1 kilo of Seville oranges That’s 5 or 6 oranges and you can also add a lemon for a little extra tang especially if you can’t get your hands on Seville oranges. My sister and gran would skip this step. I am sure that it makes no difference, but my Mum does it and it might make the hot oranges easier to handle at the de-pipping stage. Plonk your gnarly oranges in a big pan and cover with water. Bring to the boil them simmer until pulpy and soft. Keep an eye on them to make sure that the water is still covering. And while this is on the go you can sort out your jars*. Six regular jam jars should do it. Use a slotted spoon to lift the fruit out of the liquid and onto to a chopping board to de-pip and chop. Hold on to the the liquid in the pan. De-pip the fruit halves and put the pips onto boil again in a smaller pan with some of the liquid from the big pan. While the pips are re-boiling chop up the orange flesh into small pieces. How you do this really does depend on how chunky you like your marmalade. I always just look at the chunks and ask myself if I could imagine them on a piece of toast. If yes, then it is a job done. Strain the pips and put that liquid and your chunks and pulp back into the big pan. Gradually add your sugar on a medium heat until it is all dissolved. Bring the mixture to a steady boil (my aunt calls is a rolling boil). Stir frequently and towards the end look for a skin forming on the top. My gran used to do what she called the old man’s nose test. Dollop some marmalade on a saucer and let it slide at an angle. 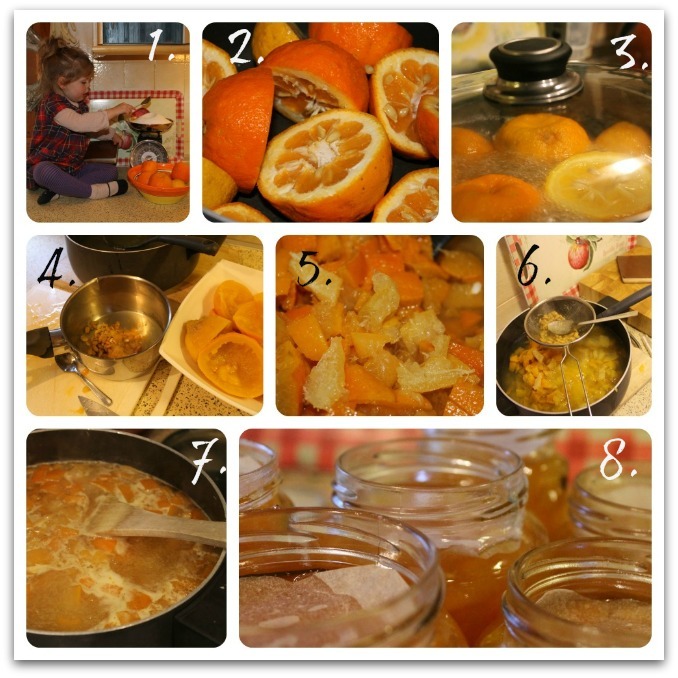 If a skin, looking like an old man’s nose, starts to form, then your marmalade is done. I use a milk jug for this bit. It does make the pouring easier but it will always be a sticky business whatever you use. Place a little circle of baking paper on top of each and let the marmalade cool before putting the lids on. Store somewhere cool. Make sure you have enough time. Marmalade needs your full attention. It will in no way make itself. A steady boil or a rolling boil, whatever you call it, don’t be shy with your boil otherwise your marmalade will not start to set. And only give away to people who appreciate the very best marmalade. It will be wasted on anyone else and might end up languishing in the back of their fridge for all eternity. This is not what you slaved over a hot pot for. * Ideally you should sterilize the jars and lids for around 20 minutes in a low oven (110ºC or 225ºF). Keep them in the oven until you use them. And remember oven gloves when handling.